Not long now until Venom will have fully fused with your local multiplex, sticking his snakey tongue into your popcorn. 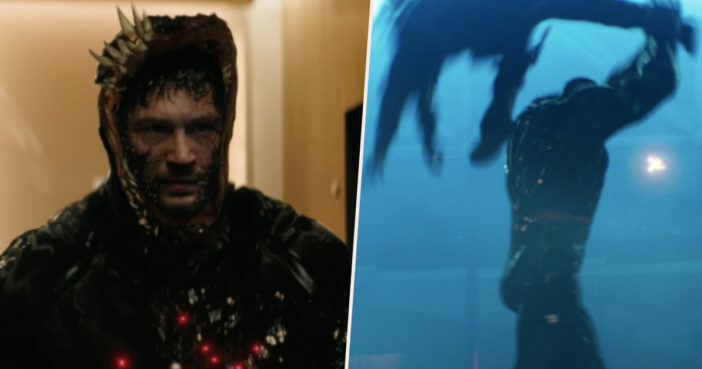 Starring the incomparable Tom Hardy as journalist turned alien hybrid Eddie Brock/Venom, this looks sure to be a dark and compelling outing for comic book fans who prefer their superheroes on the twisted side. The Ruben Fleischer (Zombieland) directed film will see Brock attempt to use his superhuman powers for good after his body merges with alien symbiote Venom. We have been given a sneak preview of what to expect, with new footage showing jaw-dropping fight scenes and an impressive use of an all-American accent on Hardy’s part. When the officers refuse to be warned, Brock transforms into the monstrous Venom; throwing the armed men around as easily as toy soldiers. The scene is suitably scary, which should appease those who have recently balked at the movie’s unexpected PG-13 rating. This clip also gives us an idea of Venom’s formidable strength, agility and climbing skills which would leave Spider-Man green with envy. It looks great they finally did Venom justice! I just hope Sony makes more movies like these. The strength he shows. He is truly Venom. Tom Hardy is Venom. Others have remarked favourably on how the creepy transformation from Brock to alter-ego Venom is shot; with both characters shown working together seamlessly. It really shows how Eddie and Venom are working together. To me it’s exciting, because it’s a double act, The character has an ethical framework, the alien by virtue of coming from another planet doesn’t have the same ethical framework, and they have to work out how to be together so they click. He now has a beast who lives rent-free in him, It could be like somebody who’s contracted a tropical disease and gone mad. It’s like acting out mental illness in some aspects, of which I have a fair understanding, having had a certain amount of mental health problems of my own, which are relevant, being an addict. So I might as well f*cking use it. I'm upset we'll never see a fight scene between this Venom and Spider-Man. I am going to love that scene in the movie. Venom was played by Topher Grace in Sony’s Spider-Man 3 (2007). Grace’s performance was lost in a film which contained too many villains, and the portrayal was criticised for diverging too much from the original comic book character. This new origin story, which will focus entirely on the complex double character, will reportedly draw from two comic book stories for source material, Lethal Protector and Planet of the Symbiotes. You can catch Venom in cinemas from October 3 onwards. Find yourself a cinema buddy to bond yourself irreversibly to and enjoy.